With Musket & Tomahawk is a vivid account of the American and British struggles in the massive wilderness region of the northeast during the Revolutionary War. Unfortunately, due to sales rights restrictions, we cannot offer With Musket & Tomahawk for sale in your country. With Musket & Tomahawk is a vivid account of the American and British struggles in the massive wilderness region of the northeast during the Revolutionary War. Combining strategic, tactical, and personal detail, this book describes how the patriots of the recently organized Northern Army defeated England's massive onslaught of 1777, thereby all but ensuring America’s independence. Conceived and launched by top-ranking British military leaders to shatter and suppress the revolting colonies, Britain’s three-pronged thrust was meant to separate New England from the rest of the nascent nation along the line of the Hudson River. Thus divided, both the northern and southern colonies could have been defeated in detail, unable to provide mutual assistance against further attacks. Underneath the umbrella of Saratoga, countless battles and skirmishes were waged from the borders of Canada southward to Ticonderoga, Bennington, and West Point. Heroes on both sides were created by the score, though only one side proved victorious, amid a tapestry of madness, cruelty, and hardship in what can rightfully be called "the terrible Wilderness War of 1777." Yet, despite intense planning and vast efforts, Britain's campaign resulted in disaster when General John Burgoyne, with 6,000 soldiers, emerged from a woodline and surrendered his army to the Patriots at Saratoga in October 1777. Overall I would recommend this book as an addition to any serious collector of American War of Independence (AWI) books, for the novice a good start to the AWI and for the wargamer a good source of game scenarios. ... a brilliantly written, meticulously re-searched, vivid and well-balanced account highlighting a four-month struggle in the pivotal year of 1777 during the American Revolutionary War. ...it makes a solid contribution to understanding the campaign by humanizing participants on both sides, from commanders to enlisted personnel to civilians residing in the path of the armies. Logusz has a flair for vivid detail, whether describing the terror Colonists felt during Indian raids on their settlements or the chaos of battles in the unfamiliar wilderness. ... a superlative saga of this time period... research is truly superb and very much in depth...relies on correspondence and reports from both sides of the conflict to bring the story of the Wilderness Campaign to life... As is so often the case reality is much more gripping than fantasy and this book surely fits into that mold. The Wilderness War is captured here with a fresh and intimate perspective. 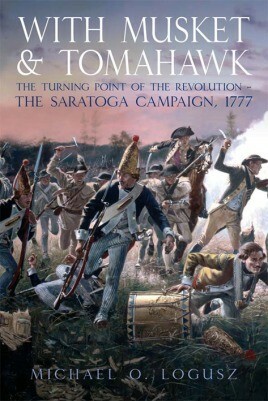 …a fascinating book... Logusz brings this part of the Revolutionary War to life with excellent detail. … It is a story with real people as they struggle to live and win the independence of a new nation. From a historical standpoint and as one who loves history, I highly recommend this book. ..does an excellent job of covering the Saratoga Campaign….